At TABS Analytics, we've always been big believers in online surveys: they're reliable, fast and economical. Our clients have used our surveys to grow their businesses in multiple consumer packaged goods ("CPG") categories. Further, we've refined our methodologies so that our analysis correlates well with industry-leading syndicated services. We're excited to launch a new tracking service that we're confident can help you grow your business by providing a competitive advantage to you and your customers. We'll be covering several categories, beginning with nutritionals ( vitamins and sports nutrition), cosmetics and baby care. Estimating and tracking the size of e-commerce, multi-level marketing and specialty channels has always been a challenge. Not anymore. In fact, the TABS tracker process got its start years ago to answer one simple, yet difficult question: "How big is the world we can't see outside of mass market channels?" By tracking share in all outlets, you'll get a complete picture of your category. 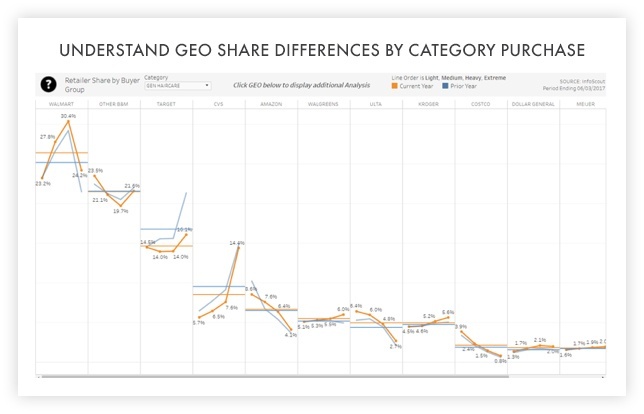 Further, you'll be able to drill down by demographic attribute and see how estimated dollar shares change by geographic outlet. Identifying buyer groups by purchase frequency and understanding where the heavy buyers are on an outlet-by-outlet basis is a critical step in developing a plan to reach them. With the TABS Syndicated Category Survey Tracker, you'll also get an understanding as to why they bought where they did. Find out if they were influenced by promotions, product innovations or both. Understanding the Who, Where and Why behind the buy will give you the edge in structuring competitive strategies and tactics specifically for accounts and channels. The TABS Syndicated Category Survey Tracker delivers a brand-level component to complete the picture of the market. 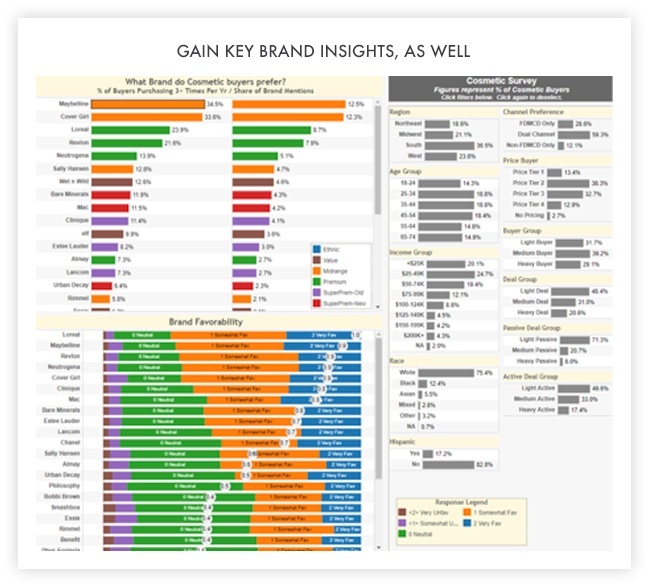 As the sample image below shows, you'll receive awareness, familiarity and share of mentions metrics for up to 30 brands in each category tracked. Drill down on a brand by specific demographics and outlets to refine your understanding. Ready to Fill in Those Missing Pieces of Your Category Puzzle? Gain the edge with your customers and in your planning with the TABS Syndicated Category Survey Tracker. Please fill out the form to your right and we'll be in touch momentarily to discuss the service in more detail. All data shown is from TABS Analytics surveys in various CPG categories, 2016-2017.